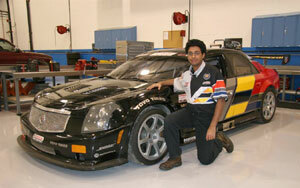 Karthik Krishnan, a graduate student with the Motorsport Engineering and Research Center (MERC) at Colorado State University successfully used his knowledge of Adams to gain an internship with the racing engineers at Pratt & Miller. It all started in the summer of 2005 when his advisor Dr. Patrick Fitzhorn gave him several Adams/Car tutorials and asked him to see what he could with this industry-leading software. Since nobody else at Colorado State at the time had used ADAMS before, this made it all the more challenging to figure out the capabilities and potential applications of the software. Luckily at this time, there was another student Joseph (Joe) Henry, who was working on a Mitsubishi Evolution 8 (Evo) track car for his thesis. Joe's work on the Evo resulted in the Volvo World Challenge Speed GT racecar coming to the MERC before the Denver Grand Prix. The challenge for Karthik was to model the measured suspension geometry in Adams . Since there was a small error factor associated with the measurements, the idea was to look at what effects these errors in measurement of geometry had on the response curves like camber, caster, toe, and roll center variation. Hence, it was decided that a DOE study would be run on the current suspension geometry where each point on the suspension would be varied in all three spatial directions within a specified tolerance amount and the effect on the response curves would be looked at. During this work, several issues cropped up and the best way to find a solution was to put the problem up in the MSC Adams University forums where industry experts often provide their help for free as a goodwill gesture. While doing this work, Karthik also found out that there was a special Motorsport plug-in for Adams/Car which is now called VI-Sportscar. Karthik managed to get a trial version of the Motorsport plug-in and started to figure out how to use it better. Also, his advisor happened to have historical track data from a race team based in Colorado. Using this data, Karthik tried out various analyses using Adams and learned a lot in that process. It was this experience that helped him get an internship at Pratt & Miller where he was hired to do more Motorsport work using Adams on the Cadillac World Challenge Speed GT team. Karthik was delighted with his internship with Pratt & Miller as it significantly increased his knowledge not only in Adams but in race engineering as well. This work on "Suspension Geometry Sensitivity Analysis using Adams/Insight" was presented at the MSC 2006 VPD Conference in Huntington Beach, California.